Bryan Stevenson, a public interest lawyer, author, founder and executive director of The Equal Justice Initiative, which in 2018 created the Legacy Museum and National Memorial for Peace and Justice, will be Penn’s Commencement Speaker at the 2019 Commencement on Monday, May 20. He and seven other individuals will each receive an honorary degree from Penn. Penn’s Vice President and University Secretary Leslie Laird Kruhly announced the 2019 honorary degree recipients and the Commencement Speaker for the University of Pennsylvania. The Office of the University Secretary manages the honorary degree selection process and University Commencement. Bryan Stevenson is the founder and Executive Director of the Equal Justice Initiative (EJI) in Montgomery, Alabama, and a widely acclaimed public interest lawyer who has dedicated his career to helping the poor, the incarcerated and the condemned. A graduate of the Harvard Law School and the Harvard School of Government, he is a professor of law at the New York University School of Law. Under Mr. Stevenson’s leadership, EJI has won major legal challenges eliminating excessive and unfair sentencing, exonerating innocent death row prisoners, confronting abuse of the incarcerated and the mentally ill, and aiding children prosecuted as adults. Mr. Stevenson has successfully argued several cases in the United States Supreme Court, including a recent historic ruling banning mandatory life-without-parole sentences for children 17 or younger. Mr. Stevenson is the author of the critically acclaimed New York Times bestseller, Just Mercy, which received the NAACP Image Award and was named by Time magazine as one of the 10 best nonfiction books for 2014. Mr. Stevenson’s work fighting poverty and challenging racial discrimination in the criminal justice system has won him numerous awards, including the MacArthur Foundation Fellowship Award Prize, the Olof Palme International Prize, the ACLU National Medal of Liberty, and the Ford Foundation Visionaries Award. In 2016, Mr. Stevenson received the American Bar Association’s Thurgood Marshall Award, and in 2018, the Martin Luther King, Jr., Nonviolent Peace Prize from The King Center in Atlanta. He has also received the American Bar Association Medal, the Association’s highest honor. In 2018, EJI opened The Legacy Museum: From Enslavement to Mass Incarceration. Built on the site of a former warehouse where black people were enslaved in downtown Montgomery, the museum examines America’s history of racial injustice and its legacy. EJI has also established the only national memorial acknowledging the victims of racial terror lynchings, the National Memorial for Peace and Justice. Mr. Stevenson will be receiving an honorary Doctor of Laws. New Jersey native, singer-songwriter, producer and actor Jon Bon Jovi, the front man and founder of the Grammy Award-winning band Bon Jovi, has made self-reliance, optimism, and community key hallmarks of his music and his philanthropy. Since forming in 1983, Bon Jovi has sold more than 130 million albums, earning status as one of the world’s best-selling musical groups, and has performed in more than 50 countries for over 37 million fans. The band was inducted into the Rock and Roll Hall of Fame in 2018, in recognition of its longevity and impact on popular music over the past three decades. Mr. Bon Jovi is also Chair of the Jon Bon Jovi Soul Foundation, founded in 2006 and dedicated to supporting innovative community efforts to break the cycle of poverty and homelessness. The Soul Foundation funds partnerships that benefit temporary shelters, transitional housing for teens, permanent supportive housing (including for veterans and special needs populations), and home ownership opportunities. In 2011, with his wife Dorothea, Mr. Bon Jovi opened the JBJ Soul Kitchen community restaurant in Red Bank, New Jersey with a pay-it-forward model serving both in-need and paying customers. In the aftermath of Hurricane Sandy, a second location in Toms River, New Jersey opened. These community restaurants have since served over 90,000 meals. Mr. Bon Jovi is a member of the Songwriters Hall of Fame and recipient of American Music and Golden Globe Awards for his original music. In 2012, he was featured on Billboard magazine’s “Power 100” ranking of the most influential people in the music business. In 2010, President Barack Obama appointed Mr. Bon Jovi to the White House Council for Community Solutions. Mr. Bon Jovi will be receiving an honorary Doctor of Music. Scientist, inventor, teacher, and author Temple Grandin is a renowned animal expert and advocate for autistic communities. Diagnosed with autism as a child, Dr. Grandin credits her parents’ advocacy and early educational intervention as a factor in her success. Dr. Grandin has devoted her career to improving understanding and conditions for livestock and has designed numerous innovations to reduce stress for animals in handling facilities. Pursuing her education at Franklin Pierce College and Arizona State University and culminating with her doctorate at the University of Illinois-Urbana, today Dr. Grandin is a professor of animal science at Colorado State University and the founder and consultant at Grandin Livestock Handling Systems. Dr. Grandin is the recipient of a great number of industry awards over four decades, including the Animal Management Award, the American Society of Animal Science; Woman of the Year in Service to Agriculture, Progressive Farmer magazine; the Distinguished Alumni Medallion, National 4-H Council; the Humane Award, American Veterinary Medical Association; and the President’s Award, National Institute of Animal Agriculture. A champion of “neurodiversity,” Dr. Grandin has been frequently featured in national media. Her story was depicted in a 2010 award-winning HBO film, as well as her memoir Thinking in Pictures and autobiography Emergence: Labeled Autistic. She is the author of over 400 articles and many books on autism as well as animal science, such as Animals in Translation: Using the Mysteries of Autism to Decode Animal Behavior and Animals Make Us Human. Her book, Calling All Minds, was a New York Times best seller for middle school students. In 2017, Dr. Grandin was inducted into The National Women’s Hall of Fame. She is a fellow of the American Association for the Advancement of Science and the American Society of Agricultural and Biological Engineers. Dr. Grandin will be receiving an honorary Doctor of Sciences. A fifth generation Hoosier, United States Senator Richard G. Lugar was the longest serving member of Congress in Indiana history, serving 36 years. Today he is President of The Lugar Center, a non-profit organization focusing on global food security, non-proliferation of weapons of mass destruction, aid effectiveness, and bipartisan governance. A professor of practice and distinguished scholar at the School of Global and International Studies at Indiana University, Senator Lugar also serves on the faculty at the University of Indianapolis, leading the Richard G. Lugar Symposium for Tomorrow’s Leaders. Following graduation from Denison University and study as a Rhodes Scholar, Senator Lugar served in the US Navy. Before election to the Senate, he helped manage the family’s food machinery manufacturing business and served two terms as mayor of Indianapolis. In six Senate terms, Senator Lugar exercised leadership on critical issues of global food security, nuclear non-proliferation, energy independence, and free trade. He led actions to reduce the threat of nuclear, chemical and biological weapons. With then-Senate Armed Services Chairman Sam Nunn, efforts to destroy weapons of mass destruction in the former Soviet Union resulted in the deactivation of over 7,600 nuclear warheads once aimed at the US. As chairman of the Agriculture Committee, Senator Lugar initiated a biofuels research program to decrease dependency on foreign oil. Senator Lugar also played an instrumental role in enacting US sanctions on the apartheid government of South Africa. In recognition of his many achievements, Senator Lugar received the American Foreign Service Association Lifetime Contributions to American Diplomacy Award, the J. William Fulbright Prize for International Understanding, and the rank of honorary Knight Commander of the Most Excellent Order of the British Empire. President Barack Obama bestowed on him the Presidential Medal of Freedom. Senator Lugar also manages his family’s 604-acre Marion County, Indiana farm. Senator Lugar will be receiving an honorary Doctor of Laws. Physician, surgeon, and human rights activist Denis Mukwege decided to study medicine while still a child in Bukavu, Democratic Republic of the Congo. Pursuing medical studies in Burundi and specialization training in France, he earned his medical sciences doctorate from the Université Libre de Bruxelles and returned home to practice in Lemera, where medical care access was severely limited. Enduring a 1996 attack in which hospital personnel were killed, Dr. Mukwege went into exile but soon returned, and in 1999 founded the Panzi Hospital at Bukavu. Intended for maternity services, Panzi Hospital instead encountered tremendous numbers of victims of sexual violence committed by armed groups of many origins. Dr. Mukwege has assisted these survivors and women with severe gynecological issues for over two decades and has publicly advocated for the empowerment of Congolese women. Internationally recognized for its holistic response to gender-based violence, Panzi Hospital has treated over 50,000 women and children. This pioneering model integrating psychological and medical care, legal assistance and socio-economic support has been implemented in countries across Africa. To extend the hospital’s outreach efforts, Dr. Mukwege established the Panzi Foundation in 2008. Despite a 2012 assassination attempt, Dr. Mukwege remains an outspoken advocate on behalf of sexual violence survivors. His efforts have brought greater global attention to the crimes of sexual violence as a weapon of war. Calling on the international community to hold perpetrators to account, Dr. Mukwege continues to raise awareness of the need for quality health care for all, for women’s and human rights, and for peace. In recognition of this work, he and Yazīdī activist Nadia Murad were awarded the 2018 Nobel Peace Prize. He has also received the United Nations Human Rights Prize, Sweden’s Olof Palme Prize, France’s Officier de la Légion d’Honneur, and the Seoul Peace Prize. In 2014, the European Parliament unanimously elected him the Sakharov Prize Laureate, its highest honor. Dr. Mukwege will be receiving an honorary Doctor of Sciences. Laurie Olin is a distinguished teacher, author, artist and one of the most renowned landscape architects practicing today. Known for his award-winning “people-centric” landscapes gracing cities around the world, Mr. Olin is Practice Professor Emeritus of Landscape Architecture at the University of Pennsylvania’s School of Design, where he taught for over 40 years. As founding principal of the Philadelphia-based OLIN, he has guided signature projects, such as re-design of the Washington Monument Grounds in Washington, DC, for which Mr. Olin won the Design Honor Award from the American Society of Landscape Architects. Other notable projects include New York City’s Bryant Park, the Getty Center in Los Angeles, and recently, the award-winning Barnes Foundation in Philadelphia and Apple Park in Cupertino, California. For over four decades, Mr. Olin has also contributed significantly to the master planning and development of the University’s campus. A native of Alaska, Mr. Olin studied civil engineering at the University of Alaska and architecture at the University of Washington. The former chair of the department of landscape architecture at Harvard University and a Guggenheim Fellow, Mr. Olin has written widely on his field, including co-authoring OLIN: Placemaking, a selection of his studio’s most celebrated projects. In 2018, the School of Design’s Architectural Archives honored Mr. Olin with an exhibition reflecting seven decades of work, including drawings, sketches, and observations from the world over. Mr. Olin is a Fellow of the American Academy of Arts and Sciences and of the American Society of Landscape Architects. In recognition of his work, he has received the Award in Architecture from the American Academy of Arts and Letters, and the 2012 National Medal of Arts. He also holds the 2011 American Society of Landscape Architects Medal, the Society’s highest award for a landscape architect. The National Building Museum presented to him the 2017 Vincent Scully Prize in recognition of his contributions. Mr. Olin will be receiving an honorary Doctor of Arts. Neville Strumpf is a renowned expert in the nursing care of older adults. Until her retirement in 2008, she served as professor of nursing at the University of Pennsylvania’s School of Nursing, where she is also a former interim dean. Since her arrival at Penn as assistant professor in 1982, Dr. Strumpf’s leadership, innovative scholarship, teaching excellence, generous mentorship and service in the University community and beyond have drawn the deep admiration of her peers. Under Dr. Strumpf’s leadership, Penn Nursing was among the first to integrate gerontology into the undergraduate curriculum. For 15 years, she directed the School’s nationally top-ranked Gerontology Nurse Practitioner Program. She also founded and was director of the School’s Center of Gerontologic Nursing Research and its Hartford Foundation Center of Geriatric Nursing Excellence. Dr. Strumpf is also former chair and advisory board member of the School’s Barbara Bates Center for the Study of the History of Nursing. Among other leadership roles as a Penn faculty member, Dr. Strumpf served the University community as chair of the Faculty Senate. Her work with research partner Dr. Lois Evans yielded the first ever clinical trial of its type, demonstrating that routine use of physical restraints was dangerous for older people. These findings contributed to groundbreaking national legislation, altered standards of care, and revolutionized practices in nursing homes and hospitals in the United States and the world. In retirement, Dr. Strumpf remains passionately engaged in improving the lives of older people, including board membership for the Mercy Life West Philadelphia PACE Program and as president of the Board of Ralston Center, a provider of services to older adults in West Philadelphia. Her many awards include Penn’s Lindback Award for Distinguished Teaching; Honorary Alumna of Penn’s School of Nursing; Distinguished Alumna Award, NYU Division of Nursing; the Claire M. Fagin Distinguished Researcher Award at Penn, and Nurse Researcher Hall of Fame, Sigma Theta Tau International. Dr. Strumpf is a Fellow of the American Academy of Nursing and the Gerontological Society of America. Dr. Strumpf will be receiving an honorary Doctor of Sciences. Astronomer Jill Tarter is the Emeritus Chair for SETI (Search for Extraterrestrial Intelligence) Research at the SETI Institute in Mountain View, California. Dr. Tarter has spent much of her career, spanning more than four decades, attempting to answer the age-old human question, “Are we alone?” by searching for evidence of technological civilizations beyond Earth. Dr. Tarter and her groundbreaking work were introduced to the public when actor Jodie Foster portrayed a character inspired by Dr. Tarter in the 1997 film Contact. When undertaking undergraduate studies in engineering physics at Cornell University, Dr. Tarter was the only woman of 300 engineering students. She went on to receive her master’s and PhD in astronomy from the University of California, Berkeley. Her success as a female scientist has served as a role model for generations of women in science. Dr. Tarter has served as Project Scientist for NASA’s SETI program, the High Resolution Microwave Survey, and has conducted numerous observational programs at radio observatories worldwide. Since termination of funding for NASA’s program in 1993, she has served in a leadership role to design and build the Allen Telescope Array and to secure private funding to continue SETI exploratory science. The author of more than 170 technical papers, Dr. Tarter lectures extensively both on the search for extraterrestrial intelligence and the need for proper science education. Dr. Tarter is a Fellow of the American Association for the Advancement of Science, the California Academy of Sciences, and The Explorers Club. She is the winner of the 2009 TED Prize, and in 2012, she was named one of the Time 25 in Space. She was the 2014 Jansky Lecturer and received a Genius Award from Liberty Science Center in 2015. Dr. Tarter served as president of the California Academy of Sciences and was awarded a Lifetime Achievement Award by Women in Aerospace. The Asteroid 74824 Tarter (1999 TJ16) was named in her honor. A biography of Dr. Tarter, Making Contact, was published in 2017. Dr. Tarter will be receiving an honorary Doctor of Sciences. The President wears as a badge of office a silver medallion of which one face is engraved, like the mace, with the University seal. The obverse (at right) of the President’s medal bears the “orrery seal,” designed in 1782 by Francis Hopkinson, A.B. 1757, a signer of the Declaration of Independence. The Wharton School of the University of Pennsylvania is pleased to announce a $2 million gift from Robert Katz (W’88) and his wife Elana Amsterdam to expand the People Lab, a research and education ecosystem built by Wharton People Analytics (WPA) to help people identify and develop qualities vital to their long-term success. The People Lab uses a digital platform to develop and administer a broad collection of scientifically grounded assessments linked to personalized learning and experiential programs. At the core of these assessments is research by leading Wharton and Penn faculty on grit, generosity, humility and ambition, which provides game-changing opportunities for students and their career fulfillment and trajectories. The Katz Fund will support continued development of the People Lab’s infrastructure, education and research. The impact will extend from undergraduate and MBA students to executive education students and external clients. Major milestones anticipated through Mr. Katz’s support include the refinement of assessment tools used to further the individual development of students, executive coaches and organizational partners as well as best-in-class research, education and technology resources. Mr. Katz and Ms. Amsterdam have made several important contributions to Penn since Mr. Katz graduated from Wharton in 1988. They have supported undergraduate financial aid for students in the Jerome Fisher Program in Management & Technology; Professor Sigal Barsade’s research on emotional intelligence; and the Penn Fund. Mr. Katz serves on the Leadership Advisory Board of the McNulty Leadership Program. 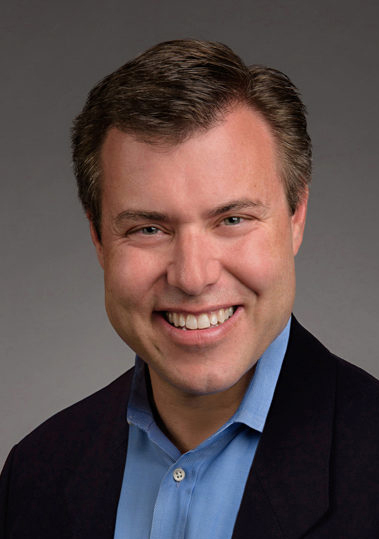 He is the chief executive officer of Vail Resorts, a premiere mountain resort company and leader in luxury lodging experiences. Wharton People Lab is a core project of Wharton People Analytics (WPA). With research as its intellectual backbone, WPA partners with organizations to educate the next generation of organizational leaders by conducting research and translating research into practice. The People Lab seeks to create and sustain a diverse network of stakeholders including students, executive education participants, alumni, faculty and external partners. In the recent Fall 2018 cycle of Penn’s internally-funded University Research Foundation, URF Conference and Impact Seminar Support (noted with *), the Office of the Vice Provost for Research has announced awards to the following members of the faculty for the projects listed below. The University Research Foundation (URF) is now accepting applications for the 5 p.m., Friday, March 15 deadline. The URF is an intramural program that provides three funding mechanisms: Research and Conference Support, Impact Seminar Grants and Research Opportunity Development Grants. provide limited institutional matching funds that are required as part of a successful external peer-reviewed application. URF Impact Seminar Grants will make awards up to $20,000 for support for a cross-school, cross-disciplinary large scale event to be held on Penn’s campus within a year of the award. Funding for this award can be used to augment an already scheduled University event. The event—which can be a symposium, forum or conference—should occur over one to two days and be open to the entire Penn community. It should highlight the scholarship of Penn faculty and bring distinguished scholars to Penn’s campus, with a particular focus on the University’s distinguishing strength in integrating knowledge. Documented school and/or department matching funds are required. The Research Opportunity Development Grant program (Phase 1 and Phase 2) was designed to facilitate the intersection of the forward trajectory of Penn’s research frontiers with the trajectory of the national and global research priorities. RODG Applications should map on to emerging research areas with new opportunities for support. Awards from these programs should be used to develop preliminary information and data for new applications in these emerging research areas. The two programs are described at right. With an identified new research area in mind, Phase 1 grants enable a team to articulate the research focus, map Penn’s intellectual assets in the new area, coalesce the appropriate group of scholars, identify Penn’s potential contributions in the area in the context of national and international research initiatives and identify a funding target. Typically a Phase 1 proposal would lead to a Phase 2 application. In addition, special attention will be paid to project proposals that include mentorship of Penn undergraduates. Applications up to $10,000 will be considered. Phase 2 grants offer extensive support for up to two years to enable specific outcomes in support of a center or group proposal to an external funding organization. Activities include research workshops, preliminary studies, networking in the relevant research community, etc. Specific outcomes are expected. Documented matching department and/or school funds will be considered positively. In addition, special attention will be paid to project proposals that include mentorship of Penn undergraduates. Applications with requests between $50,000 to $200,000 will be considered. Note that Phase 2 grants are not intended to support the development of proposals that respond to regular solicitations such as those for NIH RO1 grants or NSF Division programs. Applicants must identify a target of opportunity. Disciplines for all award programs: Biomedical Sciences, Humanities, Natural Sciences and Engineering, Social Science and Management. Undergraduate Participation: As part of the University’s commitment to providing research opportunities to scholars across our campus community, URF applicants are encouraged to include undergraduate student participants within the framework of their proposals. Budget: Each URF program has separate budget requirements. Eligibility for all award programs: Eligibility is limited to Penn assistant, associate and full professors, in any track. Instructors and research associates must provide a letter from their department chair establishing that the applicant will receive an appointment as an assistant professor by the time of the award. Adjunct and emeritus faculty are not eligible to apply. Only one application per PI per cycle. 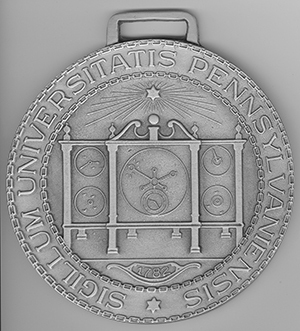 Awards must be expended on University of Pennsylvania facilities, equipment and/or associated University technical staff and undergraduate students. The Office of the Vice Provost for Research (OVPR) is excited to introduce two new research funding opportunities starting in Spring of 2019: Faculty will be able to apply for a grant to support high-risk discovery-based research or a grant to support translational research that has potential for commercialization. These two grant programs are: Discovering the Future and Accelerating from Lab to Market. Discovering the Future: A research grant that supports Penn investigators in blue-sky, high-risk/high-reward research. Grants can be as large as $400,000 over a one- to two-year term but will generally be lower. Fundamental scientific research has been the cornerstone of the continuous improvement in the quality of life over the last century. Scientific research is also the origin of technological advances that underpin the national economy. Because of declining Federal funding for scientific research while simultaneously supporting more low-risk research, a significant gap in funding for high-risk, discovery-based research has developed. This grant is designed to help fill that gap by internally supporting high-risk/high-reward research. Grants will be awarded to creative, novel research with the potential for transformative impact within a given field. The goal of the program is to advance exciting new research to a point where it can be sustained by external sponsors. Accelerating from Lab to Market: A pre-seed grant that allows faculty to receive awards in the range of $10,000 to $50,000 but could be larger if justified (up to $200,000). The lack of external pre-seed funding is often the limiting step for new ideas to come across the “valley of death” between Federal research funding and Seed/Series A funding. The Accelerating Lab to Market pre-seed grant will help to bridge this gap by internally supporting translational research. Pre-seed grants can be awarded to faculty for promising inventions disclosed to Penn Center for Innovation (PCI) and to existing Penn faculty founders of University spinout companies based on Penn-owned intellectual property. Marshall Edward Blume, the Howard Butcher III Professor Emeritus of Finance at the Wharton School of the University of Pennsylvania, died January 27 after a sudden and brief illness. He was 77. After graduating from Trinity College in 1963 with a degree in mathematics, Dr. Blume earned an MBA in 1965 and a PhD in finance in 1968, both from the University of Chicago. Throughout his time at Penn he served on various committees of the Faculty Senate, including serving as chair of the Committee on Administration and serving on the Cost-Containment Oversight Committee in the early 1990s. He retired in 2011 and earned emeritus status at that time. Dr. Blume was widely recognized as a pioneer in empirical asset pricing research and was a noted scholar in investment strategies, investor behavior and measurement of risk. He was a member of Standard & Poor’s Academic Advisory Board and was chair of the National Association of Securities Dealers (NASD) Economic Advisory Board. He served on the US Government Accounting Office Advisory Committee that investigated the October 1987 stock market crash, he co-founded Prudent Management Associates, and he advised numerous corporations, including AT&T, Dresser and Exxon Mobil. He also served as editor of the Journal of Finance. Dr. Blume was also very involved with his alma mater, Trinity College. Dr. Blume is survived by his wife, Loretta Ryan; children, Christopher, Caroline Blume Sanderson and Catherine Blume Meyerle; and seven grandchildren. For cancer to spread, it needs a hospitable environment in distant organs. This fertile “soil” can provide a home to circulating malignant cells. Recent research has shown that cancer cells from the primary tumor can help ready this soil by sending out small vesicles that contain a cocktail of molecules that “educate” healthy cells to prepare the target tissues for cancer cells to seed and thrive. Blocking this process offers one strategy to stop metastasis. New research from Penn’s School of Veterinary Medicine has identified an FDA-approved drug that, when used with surgery, hampers metastasis in an animal model. Originally developed and approved nearly 65 years ago to control blood pressure, the medication reserpine prevents what are known as tumor-derived extracellular vesicles (TEVs) from fusing to healthy cells and sharing their cargo of disease-promoting molecules, the research team found. To understand how TEVs influenced the reprogramming of healthy cells to contribute to a metastatic soil, they used a mouse model possessing a protein resistant to degradation. These mice, they found, resisted uptake of TEV, and did not develop lung metastases from melanoma tumors. The team discovered that healthy cells from these mice were less likely to take up the TEVs because the lipid membrane of the vesicle did not efficiently fuse with the lipid membrane of the cell. The researchers found success in pretreating cells with 25-hydroxycholesterol (25HC), a compound that is induced by interferon and has been shown to disrupt fusion of lipid membranes. But 25HC degrades quickly in the body. The scientists then landed on reserpine. While reserpine given alone to mice with a melanoma tumor appeared to have little effect on tumor growth and survival, mice that received the reserpine treatment before and after surgery seemed to disrupt the reprogramming of healthy cells. Overall survival of these animals significant improved, and the treatment “virtually eliminated” evidence of lung metastases, the researchers report. “We are eager to get this into the hands of medical and veterinary oncologists,” Dr. Fuchs said. A new study from the University of Pennsylvania School of Nursing’s Center for Health Outcomes and Policy Research (CHOPR) describes the quality of end of life care in nearly 500 US hospitals, utilizing nearly 13,000 bedside nurses as informants of quality. The study has been published online. It will also appear in the Journal of the American Geriatrics Society. The majority of nurses (58%) rate their hospital’s end of life care unfavorably. The most common quality problem nurses cite (53% of nurses) is that patients often experience painful procedures that are not likely to change their clinical outcome. This finding is consistent with growing trends towards aggressive medical intervention in the final days of life, which is widely recognized as inappropriate for terminally ill individuals. More than one-third (37.7%) of nurses report being discouraged from discussing alternative care options with patients/families. A similar percentage of nurses say they often disagree with their physician colleagues about end of life care decisions—and feel decisions are not made as a team. The study found that end-of-life care is best in hospitals characterized by effective nurse-physician teamwork, where authority is devolved to nurses to act in their areas of expertise, where nurses have manageable workloads, and where nurses are highly engaged in hospital decision making. “For patients and families, making health-care decisions at the end of life is stressful. They want to be cared for by a team of providers that elicit and respect their care preferences. They want information about disease progression, symptom management, and the full array of care options. They want to be acknowledged as a whole person—with goals beyond prolonging life. This is at the heart of nurses’ work,” said Dr. Lasater. Little is known about what genetic or molecular forces drive the need to sleep—until now. In a study of over 12,000 lines of fruit flies, researchers from Penn’s Perelman School of Medicine have found a single gene, called nemuri that increases the need for sleep. The findings were recently published in Science. “While it’s a common notion that sleep and healing are tightly related, our study directly links sleep to the immune system and provides a potential explanation for how sleep increases during sickness,” said senior author Amita Sehgal, professor of neuroscience and director of Penn’s Chronobiology Program. The authors note that cytokines such as interleukin-1 (IL-1), an immune cell molecule, are implicated in human sleep. IL-1 can function in the same pathway as AMPs, and it accumulates after prolonged wakefulness and appears to promote sleep. In mammals, cytokines can induce production of AMPs, but AMPS may also affect the expression of cytokines. Given this relationship, the researchers conclude that NEMURI is a working link between immune function and sleep. Researchers at the University of Pennsylvania’s School of Engineering and Applied Science, the University of Illinois at Urbana–Champaign, and the University of Cambridge have built a sheet of nickel with nanoscale pores that make it as strong as titanium but four to five times lighter. The empty space of the pores, and the self-assembly process in which they’re made, make the porous metal akin to a natural material, such as wood. Infusing the empty space with anode and cathode materials would enable this metallic wood to serve double duty: a plane wing or prosthetic leg that’s also a battery. The study, published in Nature Scientific Reports, was led by James Pikul, assistant professor in the department of mechanical engineering and applied mechanics at Penn Engineering. The struts in the researchers’ metallic wood are around 10 nanometers wide, or about 100 nickel atoms across. Other approaches involve using 3D-printing-like techniques to make nanoscale scaffoldings with hundred-nanometer precision, but the slow and painstaking process is hard to scale to useful sizes. Dr. Pikul’s method starts with tiny plastic spheres, a few hundred nanometers in diameter, suspended in water. When the water is slowly evaporated, the spheres settle and stack like cannonballs, providing an orderly, crystalline framework. Using electroplating, the same technique that adds a thin layer of chrome to a hubcap, the researchers then infiltrate the plastic spheres with nickel. Once the nickel is in place, the plastic spheres are dissolved with a solvent, leaving an open network of metallic struts. Roughly 70% of the resulting material is empty space. With a density on par with water’s, a brick of the material would float. 21 Mindfulness: An Invitation to Pause; with Mara Wai; noon; rm. 216, Claire Fagin Hall; register: https://ppsa.upenn.edu/events/ppsa-presents-mindfulness/ (PPSA, The Penn Program for Mindfulness). 13 Feminista Jones in conversation with Tanji Gilliam; 6:30 p.m.; Penn Book Center. 16 Poetry Reading with Ryan Eckes, Alexis Almeida and Marwa Helal; 2:30 p.m.; Penn Book Center. 21 Crisis at the Border: The Effects of Trauma and Stress on Migrant Children and Families; Colleen Kraft, American Academy of Pediatrics; noon; Bodek Lounge, Houston Hall; register: kraftseminar.eventbrite.com (Center for Public Health Initiatives, CHOP PolicyLab). 22 The Creative Nature of Memory and How the Brain Builds Knowledge; Dasa Zeithamova, University of Oregon, and Patricia Moss-Vreeland, artist of the In Search of Meaning: Memory Becomes Us exhibition; 5 p.m.; Quorum, second floor, 3675 Market St. (EKG). The February AT PENN calendar is online. The March AT PENN will be published February 26. In 2008, the University of Pennsylvania was given the contents of the Gotham Book Mart, the legendary New York City bookstore founded by Frances Steloff in 1920 (Almanac January 27, 2009). 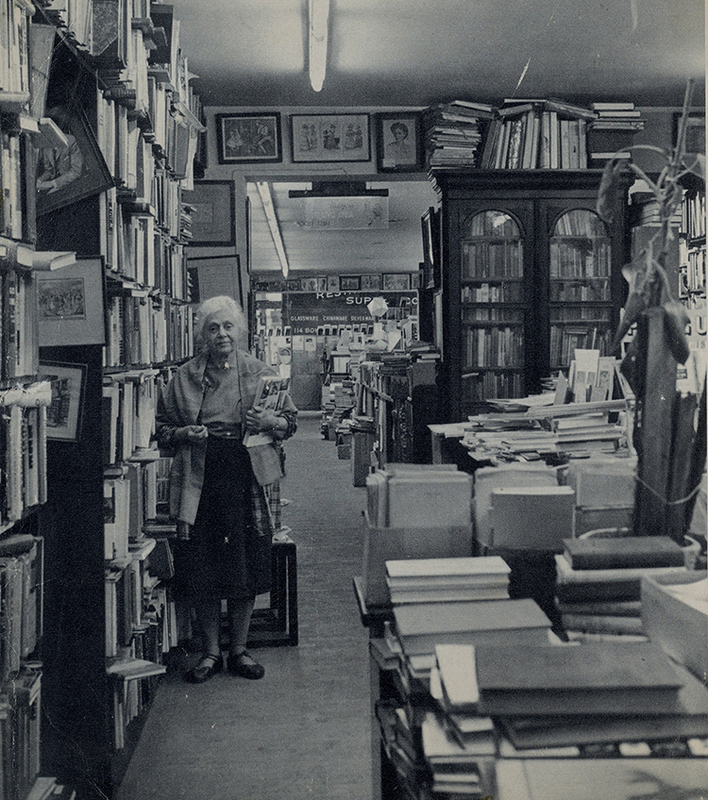 To mark the 100th anniversary of the store’s founding, the Kislak Center for Special Collections, Rare Books and Manuscripts will host an exhibition in honor of Ms. Steloff and her famous bookshop. For decades the Gotham Book Mart was, as Ms. Steloff prosaically put it, “the headquarters of the avant-garde.” The exhibition, Wise Men Fish Here, A Centennial Exhibition in Honor of the Gotham Book Mart, 1920-2020, explores the shop’s role in assembling, publishing and promoting groundbreaking experimental writers, as well as its later years under the ownership of Ms. Steloff’s hand-chosen successor, Andreas Brown, focusing on Mr. Brown’s passion for postcards and collaborations with graphic artist Edward Gorey. The exhibition runs from February 18-May 20, 2019 at the Van Pelt Library. For the past eight years, Penn Libraries curators and staff have unpacked and processed over 200,000 items and unveiled 150 linear feet of archival materials. From this mass of “stuff,” Curator David McKnight has, with the assistance of Katherine Aid and Camille Davis, selected 300 pieces ranging in date from 1900 to 2000. Drawing upon the collection’s vast array of material evidence—books, periodicals, manuscripts and ephemera—the exhibition will narrate the history of the shop from its earliest beginnings to its demise in 2005. 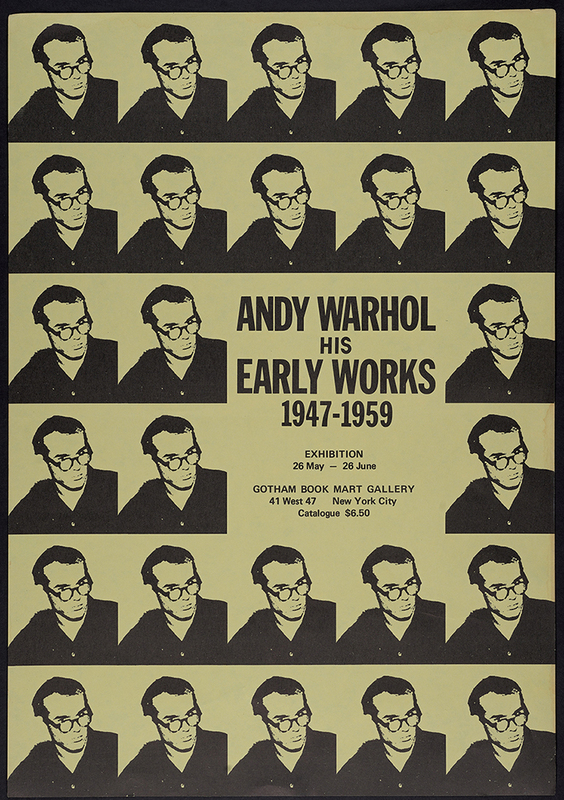 In conjunction with Wise Men Fished Here: A Centennial Exhibition in Honor of the Gotham Book Mart, 1920-2020, the Kislak Center is hosting a conference from February 28 to March 2 on the theme of Modernism - Materiality - Meaning. The Conference will be held in the Libary’s Class of 1978 Orrery Pavilion, Kislak Center for Special Collections, Rare Books and Manuscripts. During its formative years, the Gotham Book Mart was one of the few book shops in North America to specialize in avant-garde and modernist literature, film and art. Responding to the growing interest in the concept of the modernist book store, the three-day conference will provide a framework to explore the role of the Gotham Book Mart within the larger context of the printing arts, non-commercial publishing, retailing and the marketing of modernism; as well as, examining the important role of little magazines and small presses; Surrealism; the New York poetry scene; the Beats and Edward Gorey. The conference will be preceded by a film festival inspired by the Gotham Book Mart promotion of Modernist film. Other events will include a poetry reading, panels and workshops. The keynote speaker is professor Andrew Thacker, from Nottingham Trent University. The Division of Human Resources and Penn Athletics invite benefits-eligible faculty and staff to cheer on the Penn Women’s and Men’s Basketball teams at the Palestra on Saturday, February 23. The Penn teams will take on Cornell. The women’s game begins at 4:30 p.m. and the men’s game begins at 7 p.m. Each Family Night ticket includes a discounted ticket to both games, compliments of Penn Athletics, and a $5 concession coupon redeemable for food and beverage, compliments of the Division of Human Resources. Family Night ticket prices are $6.50 each for adults and youth. Tickets are required for the back-to-back basketball games. One ticket includes both games. The maximum number of discounted tickets each faulty or staff person can purchase is four tickets. Order tickets online at www.hr.upenn.edu/familynight or at The Penn Athletics Ticket Office located at Weightman Hall (235 S. 33rd Street between Walnut and Spruce), until Monday, February 18. Game night promotions include a toast-shaped towel giveaway, while supplies last, recognition of 2004 and 2014 Ivy League Champions at the women’s game, and performances by the Palestra Honor Band and Hula Hooper Lauren Resnick at the men’s game. To pick up your $5 complimentary concession coupon(s), present your game ticket and your Faculty/Staff PennCard to the Human Resources table outside the entrance to Section 208 the night of the game. A Human Resources representative will give you one coupon per ticket for up to four tickets. Pickup will close at the end of the first quarter. Go Quakers! Below are the Crimes Against Persons, Crimes Against Society and Crimes Against Property from the campus report for January 28-February 3, 2019. View prior weeks' reports. —Ed. This summary is prepared by the Division of Public Safety and includes all criminal incidents reported and made known to the University Police Department for the dates of January 28-February 3, 2019. The University Police actively patrol from Market St to Baltimore and from the Schuylkill River to 43rd St in conjunction with the Philadelphia Police. In this effort to provide you with a thorough and accurate report on public safety concerns, we hope that your increased awareness will lessen the opportunity for crime. For any concerns or suggestions regarding this report, please call the Division of Public Safety at (215) 898-4482. Below are the Crimes Against Persons from the 18th District: 4 incidents (2 indecent assaults and 2 robberies) were reported between January 28-February 3, 2019 by the 18th District covering the Schuylkill River to 49th Street & Market Street to Woodland Avenue. Penn’s Office of Information Security saw a rise in gift card phishing scams on campus in the last few months. Typically, the scammer sends an email message to a Penn staff member pretending to be a high-ranking administrator, e.g., School Dean or Executive Director. The message indicates the sender is occupied and in need of immediate assistance in purchasing gift cards from a specific store or brand for a specific amount. The message also requests that the recipient send back the gift card codes to the sender either by taking a photo of the codes and sending the image back as an email attachment or sending back the list of codes in an email. Verify the message with the sender, with your manager or IT support provider before you take any action. If in doubt about the email address, hit reply to but don’t send. Pay attention if the email address changes in the reply to field to a non-Penn email. This is not how Penn does business. Penn personnel will NOT ask you for assistance in purchasing gift cards for personal purposes. A bit more than 20 years ago, about two dozen Penn people, predominantly staff, from across the University and its Health System gathered on the second floor of Houston Hall. They were there in response to a query about starting a group for staff interested in creative writing. At a university so large, varied and forward-looking, the thinking was that there would likely be some support for such a project. The idea for the group was Jennifer Baldino’s, then director of external affairs in the Office of the President. And although the number and makeup of the members has changed over the years, what became known as the Penn & Pencil Club has flourished. In its earliest days, the members met at different locations including local restaurants after work hours. Later it found a more permanent and very welcoming home at the Kelly Writers House, where the group has also held annual public readings. P&PC members—including a few who have been part it since its first years—have come from all parts of the University. Among them: the Laboratory for Research on the Structure of Matter (LRSM), the department of pathology and laboratory medicine, the Vet School’s department of pathobiology and its communications team, the University’s Development Office, the Wharton School’s information technology department, the Center for Technology Transfer (now called the Penn Center for Innovation), the publications office of the Health System, the University Press, and Counseling and Psychological Services (CAPS). The usual practice is to write and submit whatever the individual member prefers, and because P&PC now meets twice a month, there is less waiting time in the queue for submissions to be dis-cussed. The range of submissions that the members consider during the workshops has been very wide. Among the offerings the group has considered in the past: first-person essays; short stories about fashion, with a touch of fantasy; humorous poems about almost any topic under the sun; part of a novel featuring Greek mythological creatures but transposed to the contemporary American Northwest; poems generated by computers—and subsequently published in literary magazines; innovative (aka eccentric) microfiction based on the dictionary; a science fiction novel set in the far future when humanity has left Earth and is seeking new homes; and a novel set largely in the early years of the Civil Rights Movement. At other times, the group has worked on joint projects, such as two (unfinished, alas) novels, for which any member could draft a chapter and then the group voted on which to add to the se-quence. For another project, known as Exquisite Corpse, developed by French surrealist writers, words or images were provided by members and then assembled into poems. Another project challenged members to incorporate words clipped from newspapers and magazines into sketches and short stories—for example, “Reflections of ancient glory,” “With a little hollandaise,” “liquidators,” and “When the Plants Take Over a Home.” The purpose is always to get the creative juices flowing! This is an opportunity for promising high school writers from diverse backgrounds to learn from Penn’s faculty and staff as well as their fellow participants at the Kelly Writers House. Participants will live in one of Penn’s College Houses throughout the program and will have opportunities to explore Penn and Philadelphia when they’re not writing and reading. The program offers financial assistance in the form of full- and half-tuition grants to a number of participants, thanks to the generosity of longtime friend of the Kelly Writers House, Maury Povich (C’62). Because of their commitment to keeping the class sizes small and the limitations of the intimate space, KWH will only be able to accommodate a small number of qualified candidates. The application is now open and is due March 3. Please note that admission, or lack thereof, to this program will have no direct impact on a student’s chances for eventual admission to Penn. More information about the Summer Workshop and access to the application is available online. Send email to summer-writing-workshop@writing.upenn.edu with questions. Correction: On the back page article of the February 5, 2019 issue, the article “Love Temple at Morris Arboretum” incorrectly described the acquisition of Morris Arboretum. Lydia Morris bequeathed her estate to the University of Pennsylvania in her will upon her death in 1932. The arboretum opened to the public in June of 1933 as the Morris Arboretum of the University of Pennsylvania. We regret the error. —Eds.